Information from "A Chronicle of Aitkin Minnesota ~ 1871-1971"
"A CHRONICLE OF AITKIN MINNESOTA ~ 1871-1971"
in celebration of their hundredth anniversary. D. D. Owens in his Geological Survey of Wisconsin, Iowa and Minnesota, published in 1852, describes the local landscape: "At the mouth of Mud River, Col. Whittlesey and myself left the Mississippi with one canoe and two voyageurs. We began to ascend Mud River of the 6th of October 1848. It is a small stream, from twenty to twenty-five feet wide, very crooked, and much obstructed by boulders." Even William A. Aitkin, the American Fur Company trader, established his post upriver. His name was dispensed, five years after his death, to the territory comprising the present county by the Minnesota Legislature in 1857. Misspelling the name "Aiken," they compounded their error further. "And the county seat of said county is hereby established, temporarily, at Lankiagun city," a settlement described by some latter day historians as "an Indian village located at the mouth of Mud River." The Sioux Indians, a nation of fierce warriors were long time occupants of Aitkin county until the 1600's when the Chippewa or Ojibway tribes, forced westward by warlike Iroquois, began encroaching on the lake-studded hunting paradise in Minnesota. armed by the French, the Chippewa had the advantage, and although the early history of the state reveals countless bloody battles between the tow tribes, the Sioux were eventually and unhappily forced to the plains of the Dakotas, shorn of their birthright on one hand by the Chippewa, victims of the small print in government treaties on the other. Their brothers, the Chippewa, were soon to travel the same route, treatywise, with the net result that most of the choice real estate in the Minnesota territory was ceded through one treaty or another to the Great White Father for distribution to settlers. 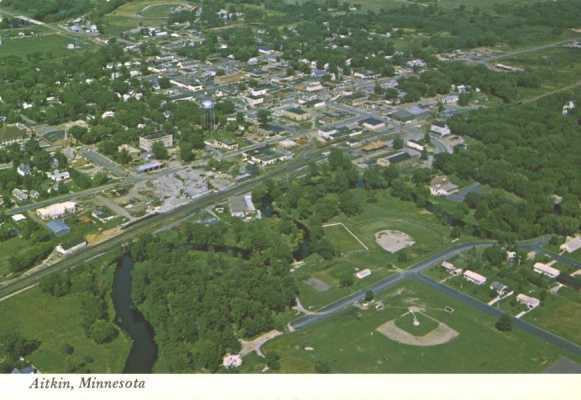 The present village of Aitkin owes its existence to a number of factors, among them the Northern Pacific railway and the Tibbetts family (see early settlers page), most probably in that order. The railway provided a direct route to civilization which made its Seville a distinct but no more important on than that provided by the river boats which carried their passengers upstream to into the wilderness of the logging country. Charles Viebahn came to Aitkin as a young man, was a hotel clerk for a time at the Whipple House and later entered in partnership with Billy Punteney as engineer to form the Mississippi Transportation Co., Viebahn as captain, running sternwheelers between Aitkin and Grand Rapids, occasionally to Brainerd. During the season of 1882 over 175, 000,000 feet of pine logs floated by Aitkin, while eight million feet were sawed here. Fifteen thousand telegraph poles and 10,000 cedar posts were also turned out. The thirsty logger could, at one period in Aitkin's early history, could take his choice of over 17 saloons. James W. Tibbetts was Aitkin county's first sheriff. His initial term was of no great length, but following a short period of retirement, he appears to have reconsidered and again assumed the responsibility. 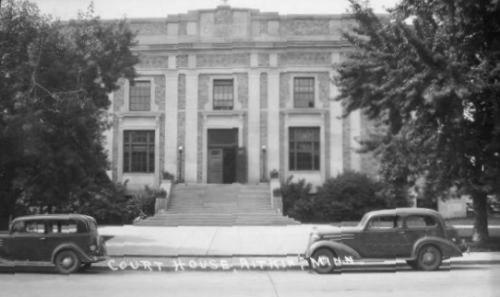 Others serving in the capacity of Sheriff were; William Hallstram, N. Tibbetts, J. Markham, Ole Mausten, Andrew Newstrom, Christ Haugen, I. E. Boekenoogen, Carl S. Lind, Ned Price, Hjalmer Hulin, Fred Erlandson, William Sobey.Aitkin's first mayor was G. W. Knox, elected along with his council in 1883. The job was a challenging one, and early files of the local newspapers record a number of lively council sessions, with spirited disagreements often occurring and an occasional fisticuffs. each man usually had the benefit of the town in mine, and felt no compunction in asserting his opinion. The community respected its village officers, and liked a good fight. THIS INFORMATION IS FROM CYNDI TISDELL'S SITE. The community of Aitkin County lies within the Mississippi river drainage basin, near glacial lake Aitkin. The area is dotted with numerous lakes formed as the glaciers retreated. Toady, all that remains of glacial lake Aitkin is the rich soils of its lake bottom which were fertile growing for early farmers. Peat deposits are still harvested from the former decaying vegetation from the alkaline bottom. 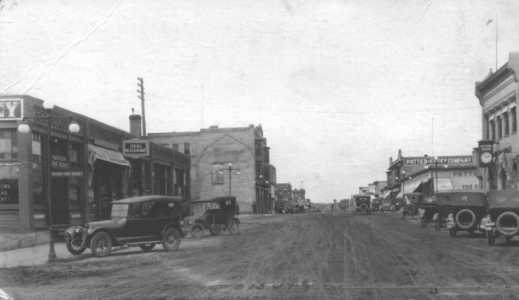 In 1870, a local Northern Pacific surveyor by the name of Nathaniel Tibbetts established the town-site of present day Aitkin. He recognized the importance of the site as it was the first access to the Mississippi river by rail from the inland of Duluth. 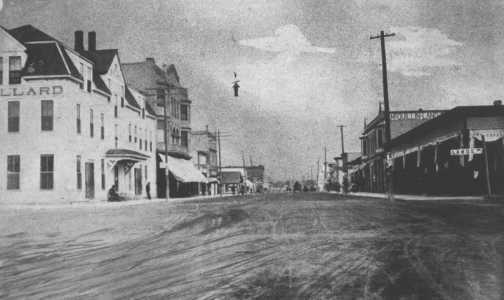 The town quickly blossomed as a lumber industry boom town. Because of the close proximity of rail transportation and Mississippi river access, Aitkin also became a major river boat transportation center. 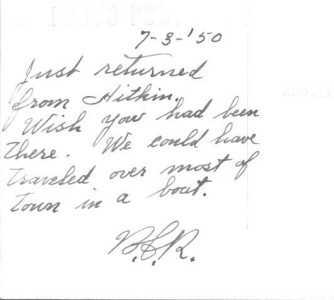 No less then 14 boats operated out of Aitkin between 1870s and the early 1920s. Among the notables of river transportation were Charles Viebahn and W. F. Puntney who formed the Mississippi Transportation Company in Aitkin and operated the steamboats Irene and Oriole. The riverboats served the logging encampments and homesteaders up and down the Mississippi between Brainerd and Grand Rapids. Grand Rapids itself was a product of Aitkin and the riverboat industry. As logging camps expanded ever further north, they had to wait until supplies reached "the rapids" and then had to transport them by boat or wagon road camp. Warren Potter, Aitkin's pioneer business leader, got the idea of building new buildings near the landing at the rapids to supply the camps quicker and beat out his competition back in Aitkin. His competitors were still shipping orders via steamboat. 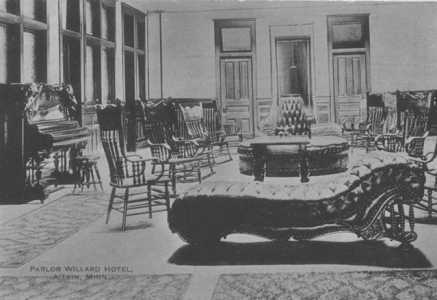 The idea caught on and soon his competitors from Aitkin followed, thus the town of Grand Rapids became a product of the Aitkin business community. 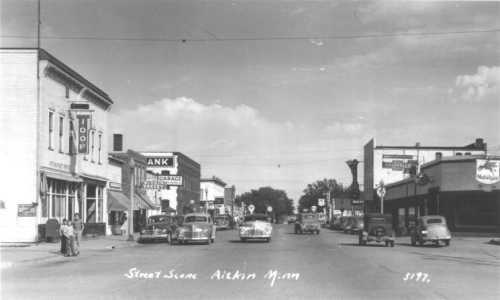 Aitkin was a wild and wooly logging boom town that supported a record 17 "we never close" saloons and several houses of ill fame to keep up with the lumberjack tide that poured from the woods each summer to rollick in "civilization" with fresh money burning a hole in their pockets. Fisticuffs, knifings and shootings among these rough and tumble lumberjack were not uncommon in the early days. 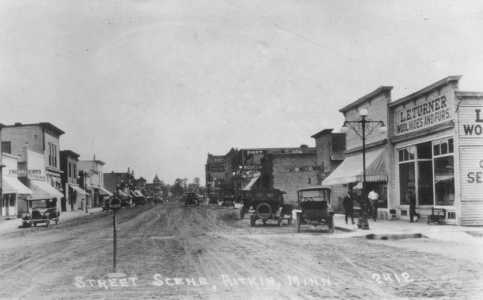 Aitkin began to tame into more respectable community by the late 1800s. Masquerade balls, ice cream and church socials were far more commonplace than rowdy lumberjacks and saloon fights. Houses of ill-fame were banished from the city limits. 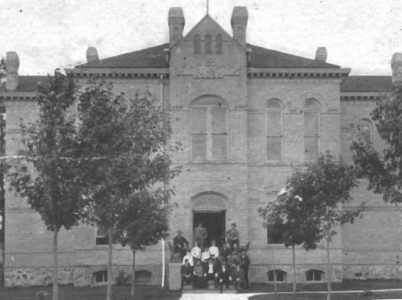 In 1873, the first school district in Minnesota was established in Aitkin. 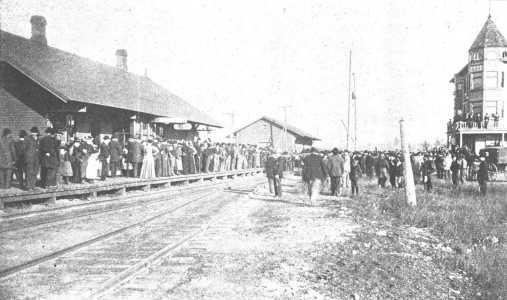 By 1883, Aitkin had its own newspaper, The Aitkin Age and Aitkinites were treated that year by the special train stop by former president U.S. Grant. By the end 1892, a new telephone exchange was serving the area. In 1895, the first electric power was generated in Aitkin. 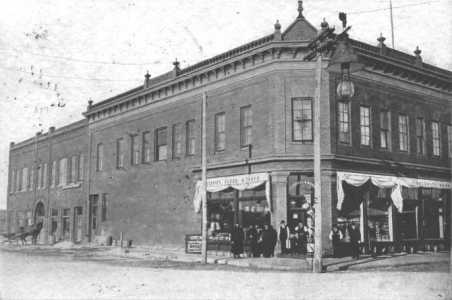 In 1903, the entrepreneur and lumberman Samuel Hodgedon brought serious cultural entertainment to the community when he built the two story Opera House building. The Mississippi river's involvement with Aitkin's history continues to modern times. 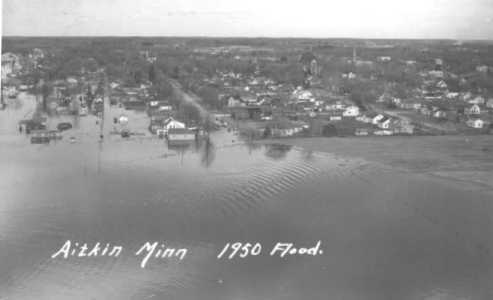 Heavy spring flooding culminating in the flood of 1950 caused local government to lobby for a solution. The Mississippi River Diversion Channel north of Aitkin was part of that solution. It stands as the only diversion channel on the Mississppi river between Lake Itasca and the Gulf of Mexico. Later in the 1970s, a dike system was established to further protect the city. This hotel is standing to this day. Randy's "Mormor" (Swedish grandmother) once worked there. 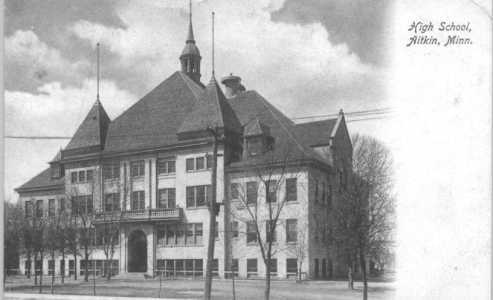 This building was torn down in the late 1920s. Judy Garland once performed here. The building is known today as "Butlers HIGH END Department Store." Their motto is: "If we don't have it, you don't need it!" A lot of history can be found throughout the store in pictures and antiques. Randy says: "Gambles, on the left hand side, employed most of my family, the Nickanders and the Walls, at one time or another. Everything we had at home or on the farm was from Gambles." 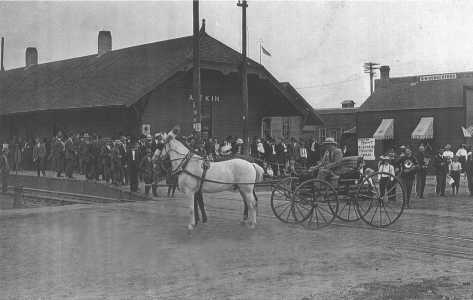 This is the first depot in Aitkin, The Northern Pacific Railroad Depot. 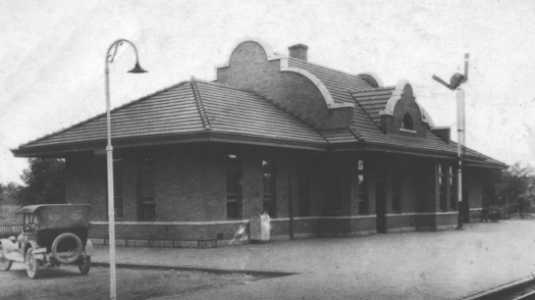 It was destroyed by fire in 1880's and rebuilt on the other side of the railroad tracks. Today it is the Aitkin Depot Museum. This is the only known photograph. 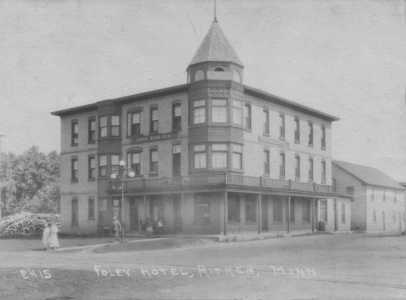 On the right, in the back, is the Foley Hotel. This is a wonderful old postcard, taken at the Northern Pacific Depot during World War One. It appears the entire town, complete with a brass band, has turned out on a rainy day to welcome home the returning soldiers. Aitkin MN Depot, now the home of the Aitkin Museum. 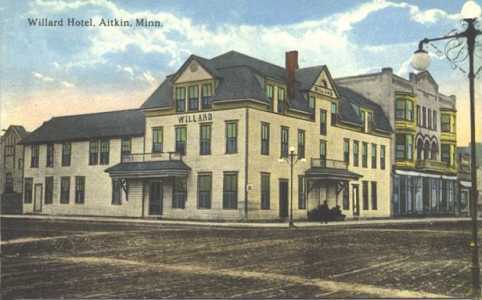 Aitkin had two depots. 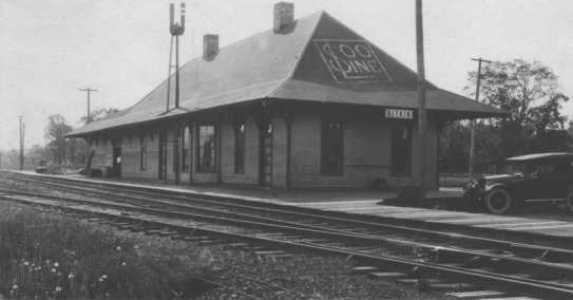 Pictured above is the Soo Line Depot. 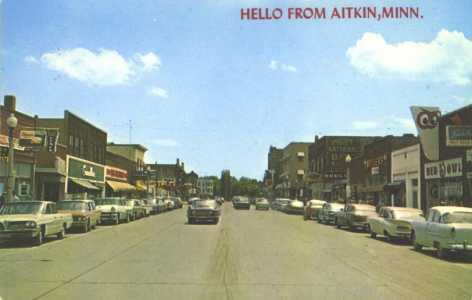 A postcard showing Aitkin in the 1950 flood. The back of the postcard! Front Row L to R: Homer Hegland, Vernon Bass, Ross Stephens. Wilfred Sanford, and Wayne Stephens. Second Row L to R: Carl Nickander, Harold Walz, Kari Laukkanen, Leon Beebe, Floyd Hogan, Roy Partridge, Warren Shisler and Lee Barrett. 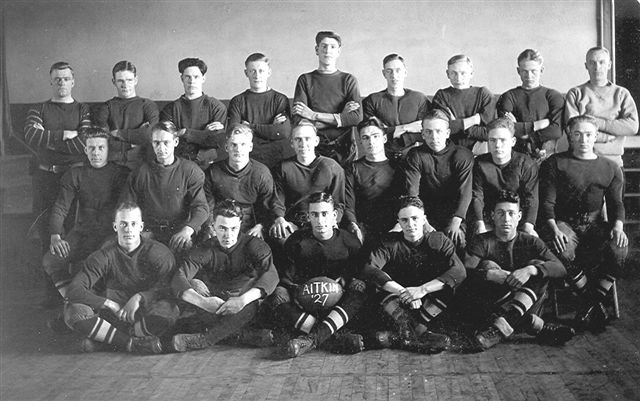 Third Row L to R: Coach Russell Hall, Kenny Newstrom, Cecil Booker, John Ratcliffe, Barney Barnevelt, Floyd Daly, Herman Hulin, Norman Helf, and Coach Ernie Madsen. This list of names were collaborated by Nicky (Linnea Nickander) Franzen, Debra (Hagman) Janzen, Stuart and Marty Stephens, Kim (Heft) Cook, and Randy Wall. We are 85 percent sure of the names assigned to each person in the picture here. The players' names were gathered from local Newspapers of Aitkin and the relatives of the members of the team. There is a lot of history here of some well established Aitkin families, then and now. It's fun to see the team "alive" again.